Redirecting your kitten with appropriate toys can save his littermate's neck. Kittens look so cute when they're cuddled up together, but they can appear fierce during playtime. Rough play is normal in kittens and cats up to about 2 years old, and that includes biting each other under the neck. This is a quick way to kill prey, so your cat is likely keeping his hunting skills sharp. Cats are predatory creatures in the wild, hunting for prey to curb their carnivorous hunger. They must be fast and accurate when trying to bring down their prey, and kittens start practicing this behavior early by wrestling with littermates. Young cats continue this play, often tumbling over each other or biting each other's necks -- one of the best targets when trying to kill prey quickly. This is normal behavior that helps prepare them to hunt their own meals. When young cats play rough, they are learning proper boundaries. If one bites another's neck too hard, her sister might yelp and run away, ending the play session. In this way cats learn to inhibit their biting and keep their claws sheathed during playtime. 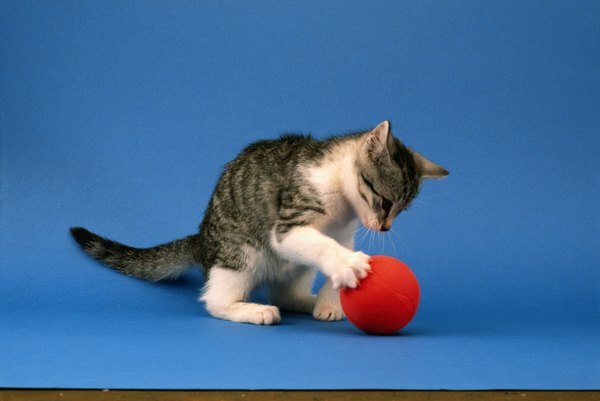 Cats work on reward systems; if they enjoy an activity, they want to keep doing it. If biting too hard stops the enjoyable activity, they learn to bite softly the next time. This also helps prepare your cat to play with you, as she learns she gets more playtime if she doesn't hurt you. Not all biting between cats is in the spirit of play. Cats can be aggressive toward each other over food, toys, territory or even you. This is especially true if you have more than one unneutered male cat in your home. When the biting is accompanied by howling, hissing or scratching, it's likely aggression instead of play. Talk with your vet if you notice continued aggression and biting between your cats; she might recommend the help of an animal behavioral therapist. Although play-biting with other cats can help your kitty learn not to bite you hard, she might still hurt you when she gets overstimulated. Moving away and ending your play session can help her learn not to bite, but you can also give her a toy that you don't mind her attacking vigorously. Large stuffed toys give her the chance to get under the toy, scratch it with her hind feet and bite its neck to her heart's content. Dangling toys work as well, but make sure she gets the chance to catch them and pull them down for some good biting action.